This ligament is composed of thin sheets connecting the spinous processes (from roots to apexes) from C1-S1 one segment at a time. 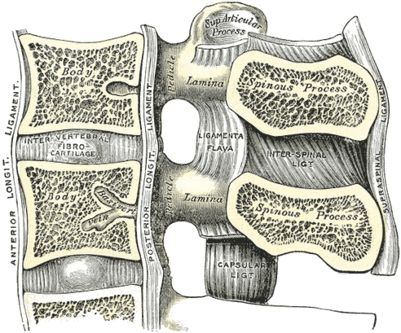 Anteriorly, Its fibres connect with ligamentum flavum, whilst posteriorly its fibres connect with the supraspinous ligament. The ligaments are narrow and elongated in the thoracic region, broader, thicker, and quadrilateral in form in the lumbar region, and only slightly developed in the neck. In the neck they are often considered part of the nuchal ligament. The role of the interspinous ligament is to limit flexion (bending forwards) through restricting separation of the spinous processes of the vertebral column. The lumbar interspinous ligaments receive an innervation from the medial branches of the lumbar dorsal rami and experimental stimulation of interspinous ligament produces low back pain and referred pain in the lower limbs.This renders the interspinous ligament as an attractive source of low back ache. Post mortem studies have shown that the interspinous ligament are frequently degenerated in their central portions, but its unknown whether these lesions are painful or not.otherwise it is conceivable that interspinous ligament might be subject to strain following excessive flexion of lumbar motion segments,but evidence of this is currently still lacking,even by way of comparing clinical history with the presence of midline interspinous tenderness and relief of pain following infiltration of local anesthetic. Fibers in the interspinous ligaments (ISL) at different levels are aligned at different directions. The directions of fibres gradually change from horizontal to vertical through the inter-spinous spaces, As one goes from the upper spaces towards the lower ones. The ISL fibres also possess different thicknesses at different levels of the lumbar spine and possibly serve diverse functions according to their orientation and thickness. ↑ physioadvisor.com. 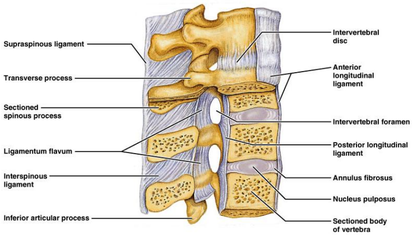 Ligaments of the Spine. Available from:https://www.physioadvisor.com.au/health/anatomy/ligaments/ligaments-of-the-spine/ (accessed 29 March 2019). ↑ Wikipedia, the free encyclopedia. Interspinous ligament. Available from: https://en.wikipedia.org/wiki/Interspinous_ligament(accessed 29 March 2019). ↑ 3.0 3.1 Nikolai Bogduk. Clinical Anatomy of the Lumbar Spine and Sacrum. 5th Edition. Churchill Livingstone: Elsevier. Feb 2005. ↑ Mahato N K. Anatomy of Lumbar Interspinous Ligaments: Attachment, Thickness, Fibre Orientation and Biomechanical Importance. International Journal of Morphology. March 2013:31(1):351-355. ↑ Keorochana G., Taghavi C. E., Tzeng S T., Lee K.-B., Liao J.-C., Yoo J. H, etal. MRI classification of interspinous ligament degeneration of the lumbar spine: intraobserver and interobserver reliability and the frequency of disagreement. European Spine Journal. 2010:19(10):1740–1745.